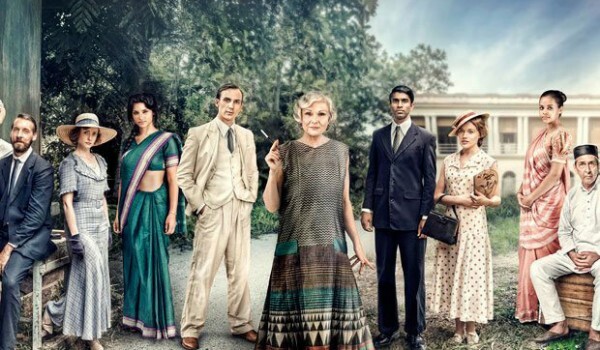 Did you watch Indian Summers last Sunday night on Masterpiece (American viewers, that is — European viewers, you’ve probably seen the whole thing)? I certainly hope so, because hot damn, this looks like it’s going to be great. Set in India in 1932, the series focuses on a bunch of different interlocking characters, from English (and American) colonials to Indians who both work for and against the British Raj. And from what I can tell from the previews, it looks like Exciting Stuff(TM) is going to happen! 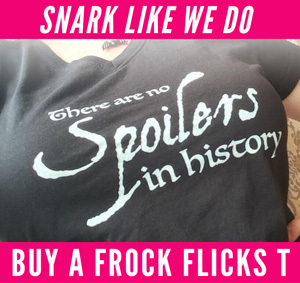 I’m excited enough about this show that I’ve decided to write a costume recap for each episode, so we can dish about what we liked and didn’t like. Keep your eyes peeled each Friday for a new post! Alice in orange. That’s a great deco print on the right, in back. This dress has a great cut. It’s almost 1940s wartime in a sense, with a very utilitarian, menswear cut — until you see the 1930s length with fabulous kick-pleats. She wears it with a side-angled straw hat with a pleated ribbon in a complimentary color. We then cut to Cynthia Coffin (Julie Walters), the very-not-poshly-accented owner (?) of the Royal Simla Club, center of British society during the winter months. The full ensemble is interesting — it’s almost 1920s in terms of loose fit, except for that skirt length. So now we’ve got one fashion-forward character (Alice) and one looking-slightly-backwards character (Cynthia). Cynthia, checking out her not-yet-ready-for-prime-time club. That’s a very 1920s lack-of-a-waist silhouette! We also meet Sarah’s husband, Dougie, and Leena Prasad (Amber Rose Revah), an Indian woman who is some kind of companion to Dougie (a co-worker?) — and now we understand part of Sarah’s sourness. Dougie is going for full whiskers in what (to me, anyway) is a very Victorian look — although I think that perhaps the filmmakers are trying to show that he is less concerned about appearances as his wife. He’s also shown not wearing a jacket. I don’t know how the etiquette varied in Indian heat, but I would think that would be a no/no. Leena is in gorgeous, dark green sari — and wearing a crucifix necklace. HMMM. The two rescue a boy who is found on the train tracks, poisoned, and they rush him off in search of a doctor (leaving Sarah and child behind and none too pleased). 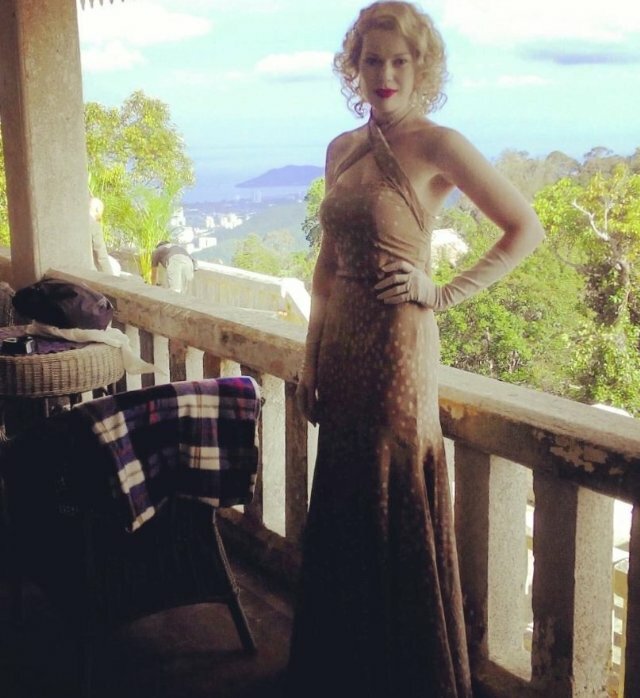 After a ride in a Rolls Royce, Alice ends up at her brother’s house. Ralph Whelan (Henry Lloyd-Hughes) is the Viceroy’s assistant (or something else important), and the two haven’t seen each other since they were children. When we first meet Ralph, he’s clearly master of his domain, and wearing a SHARP, dark, three-piece suit. Ralph, master of his domain. But then starts stripping down all the ridiculous layers (okay, just his jacket) on his way home. We meet Aafrin’s family, in particular sister Sooni (Aysha Kala). All the women in his family are wearing printed cotton saris. It turns out that Aafrin is in love with Sita (Ellora Torchia), who his parents don’t want him to marry because she’s of a different religion (she’s Hindu; I guess Aafrin is Muslim?). Sita gets a beautiful blue sari. There follows a gorgeous scene where Aafrin follows Sita through some hanging pieces of cloth, where they kiss. Madeleine (Olivia Grant) is a dead ringer for Lotte Verbeek (Geillis Duncan in Outlander, and Giulia Farnese in The Borgias). I spent the whole episode trying to decide if she was or wasn’t Lotte, and had finally decided she was by the end, only to check the credits and find out I was wrong. All the Brits start turning up at the club, including Alice who is now dressed in a lovely printed silk dress. Both the color and print are super harmonious with the vegetation around her, a strong contrast to Madeleine’s modern, geometric print. Madeleine is super elegant, but incongruous with the background and everyone else. Alice has messy curls pinned up, while Madeleine has a low bun, braid over the top, and pearls. Cynthia has a marcel wave, with low bun. Two seemingly slutty ladies try to hit on Ralph. He’s unmarried and clearly a hot commodity. Just as everyone sits down to a formal dinner, through a semi-complicated series of events, Aafrin gets shot in place of Ralph. Alice witnesses it, and stays with Aafrin until he gets to the hospital. I would like to commend her lipstick brand for staying perfect throughout the crisis. 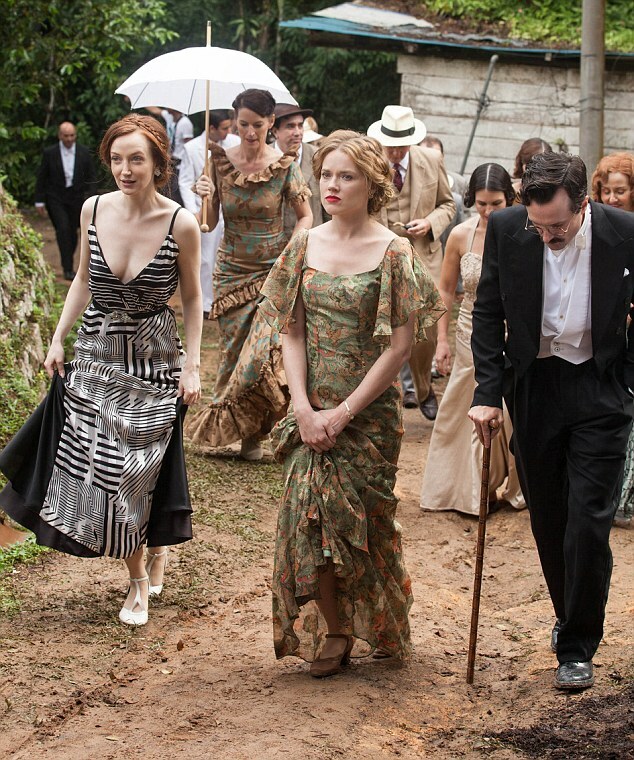 What did you think of Indian Summers‘ costumes? Will you be tuning in for episode 2? Unfortunately, I missed it and I am trying to see it before Sunday when episode 2 airs. Olivia was in Lark Rising. She played the squire’s wife. Also are you fashion reviewing Home Fires? Haven’t watched that one yet — hopefully we’ll get to it before the run is over on PBS! I enjoyed the costuming and the story line, but I’m having difficulty telling the difference between all of the pale-skinned, dishwater-blonde English roses. Aside from the ginger American, all of the western women look alike. I suspect that the color schemes that you have highlighted (pink for Sarah, and geometric prints and bold colors for Alice) will help me keep them straight in future episodes. It’ll be interesting to see how/if their wardrobes develop over time! 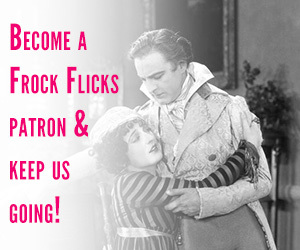 I’m right there with ya on the desire to make 1930s stuff — and where it… where??!! Excited to see you recapping this! I don’t know much about 1930s fashion but I loved how Madeline looks like she just stepped out of a period society portrait. To shed a little light on Aafrin’s family, they’re Parsi, an ethnic group who are Zoroastrian, and whom the British favored because they considered the Parsis more “intelligent and enterprising” than other Indians. An interesting focus for the series, because of their conflicted feelings about colonial rule. INTERESTING! I had originally put that maybe they were Muslim OR Sufi, but then I thought if they were Sufi they’d be doing long beards and turbans (I think??) so I ruled that out. I just have some more about Parsi, also spelled Parsee, a group of followers in India of the Iranian prophet Zoroaster. The Parsis, whose name means “Persians,” are descended from Persian Zoroastrians who emigrated to India to avoid religious persecution by the Muslims. I had a Parsi friend in design school who had been working with an Indian print company. She said that the Parsis originally worshipped fire and that they carried their dead to a wilderness area where vultures could strip them clean. That’s fascinating! Thanks for the info! All of the ladies sport some fabulous 1930s hairstyles, with low, nape of the neck arrangements. 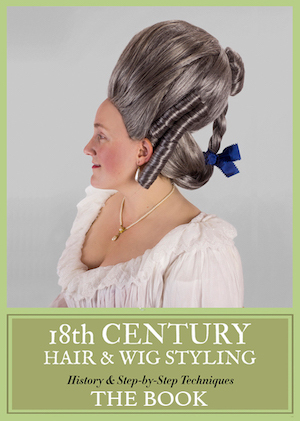 I’m having a problem with the Western women’s hairstyles. I get the feeling that whoever does the actresses’ hair try to pass a low nape chignon for a 1930s bob. I can understand older women wearing this kind of hairstyle, but the women in their 20s and 30s? Except that the bob was out of fashion by 1930, and most women starting growing their hair out then. What’s funny is that in season 2, Alice has shorter hair, which is the opposite of what would have happened historically!